We manufacture and offer a wide range of stainless steel centrifugal pumps that produce high flow rates under low head conditions. Precision engineered, these pumps are are well designed for continuous low pressure circulation and transfer of non-flammable liquids, water circulation, irrigation, spraying systems, jockey pump service, aggressive liquid applications and other general-purpose pumping compatible with pump component materials, where suction lift is required. 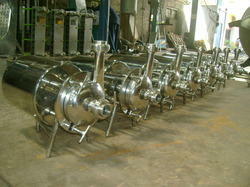 SS Centrifugal Pump with back pull-out type motor of various capacities. Motors used from Kirloskar, Bharat Bijlee. 2490 Rpm, 3 phase, 50 Hz cycles. 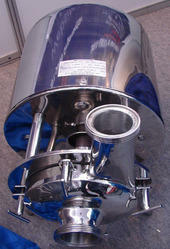 Upon Years of persistence experience and trials Jaya Industries has developed a range of SS Hygienic pumps. Jaya Industries gives the Diary, Food, Brewery and other potable liquid industries a pump that fully meets to-days requirements. The pump is of Crevice Free design and constructed from Stainless Steel conforming to AISI 30u/316/316L.The pumps are simple to clean and maintain, the pump casing being removable in a matter of seconds without the use of tools. Impeller, mechanical seal can be changed without difficulty & replacement parts are available ex-stocks. End connections can be flanged, SMS/DIN type fittings etc. Looking for Stainless Steel Centrifugal Pumps ?